takes pride in caring for animals in need. committed to excellence in patient care. and treatment for your pet. TVEH is a state-of-the-art veterinary emergency and referral hospital that delivers expert care and treatment 24 hours a day, 7 days a week. 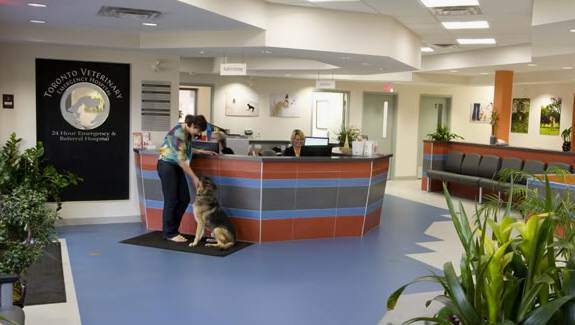 Our entire staff of veterinary professionals is 100% dedicated to providing leading edge medical care for your pet. TVEH is pleased to serve the entire Greater Toronto Area and surrounding districts, including Durham, Peel, York and Halton regions. Located at 21 Rolark Drive in Scarborough, TVEH offers a wide range of services including Surgery, Internal Medicine, Neurology and Diagnostic Imaging and Anesthesia. Our ICU, staffed by Critical Care specialists, is open at all times for seriously ill or injured dogs and cats. Urgent care for your pet may be needed at any hour, and our Emergency Department's experienced veterinarians are on duty around-the-clock providing emergency care. If needed, our board-certified specialists are on call after-hours for emergency surgeries and procedures. Our doctors, technicians and hospital staff are committed to providing excellent, compassionate care for you and your pet. As pet owners ourselves, we understand the unique bond between people and pets and strive to uphold that special relationship. Please explore our website to learn more about specific services available at TVEH.